Crusaders goalscorer Paul Heatley celebrates at Seaview against NK Olimpija Ljubjana in the Europa League. Pic by Pacemaker. 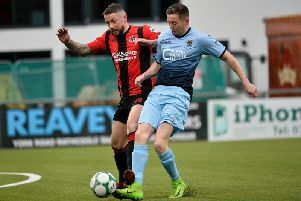 Crusaders’ new signing Rory Patterson was in attendance as the Seaview outfit drew 1-1 with Olimpija Ljubljana in the Europa League to go out 6-2 on aggregate. Former Derry City striker Patterson has signed a one-year deal with Stephen Baxter’s side. The home side went 6-1 down on aggregate in the 15th minute as Nik Kapun shot home. Crusaders rallied and Paul Heatley and Kyle Owens had chances as the Crues battled to get back into the game. In the 36th minute Crusaders keeper Sean O’Neill did well to divert a Branko Ilic effort. Much to the delight of the home support it was 1-1 in the 41st minute as Heatley shot home following a free-kick. The second half started at a more sedate pace with neither side creating many chances in the early exchanges. Heatley was causing the visitors problems with his close control and direct running but the visitors seemed happy to soak up the pressure. The Crues brought on David Cushley for Owens and kept pushing forward as they looked to claw their way back in to the tie - but at the vital moment they missed that vital cutting edge. Maybe Patterson can add that to the mix in the coming weeks? In the 67th minute Billy Joe Burns tried his luck from outside the box but it flew high and wide. As the Crues pushed forward it left gaps at the back but Ljubljana couldn’t find a way through. CRUSADERS: O’Neill, Burns, Coates, Ward, Carvill (Lowry, 90), Caddell, Forsythe, Owens (Cushley, 61), Snoddy, Brown, Heatley (Clarke, 73m). Subs not used: Doherty, McChrystal, Holden, Ruddy. Oly Ljubljana: Vidmar, Maksimenko, Kronaveter, Kadric (Boateng, 45), Kapun, Zarifovic, Crnic (Turkus, 90) Ilic, Stiglec, Savic (Suljic, 76), Tomic. Subs not used: Ivadic, Vombergar, Jakupovic, Kregar.